Step 1: Bring a famous tout on board as part of an overly complex, completely impractical program. That cliche is, of course, entirely logical. Having information that allows you to win betting on sports is essentially a license to print money, so why would you then have any need or desire to turn around and sell that information? 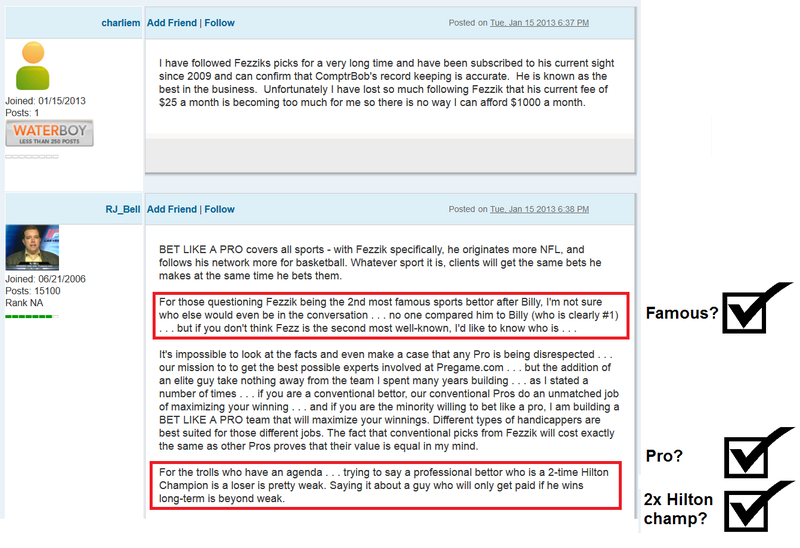 And even if you did, you run into logistical problems, since any winning gambler -- and certainly anyone who's been winning for as long as Fezzik supposedly has been -- is going to move lines every time he bets, making it extremely difficult to effectively follow him. Complicating things even further are the "LESS OBVIOUS BET TYPES" that BLAP is supposedly taking advantage of, as those markets have less liquidity, and the lines move even more in response to a wager by a respected bettor. Regardless of bet type, any time a tout tries to reassure you by explaining how the line doesn't move after he bets, that's probably not a good sign. Anyway, now we've established the impractical structure of and thought behind the program. Who's going to be the pro that gets us started? There is no mention of a) how Fezzik's career has gone since his Hilton wins in 2008 and 2009, or b) any non-contest credentials of any sort, during any period. Step 2: Claim tout has no history that is relevant to what you're currently selling (except the thing he's famous for, obviously). So, we heard about his contest wins. Does he have any other public track record? Detroit's response here makes it seem like Fezzik does not have any public history other than his contest wins. And if he does, it certainly couldn't be anything more relevant than his back-to-back contest victories, three and four years prior, respectively. But that's just not true. 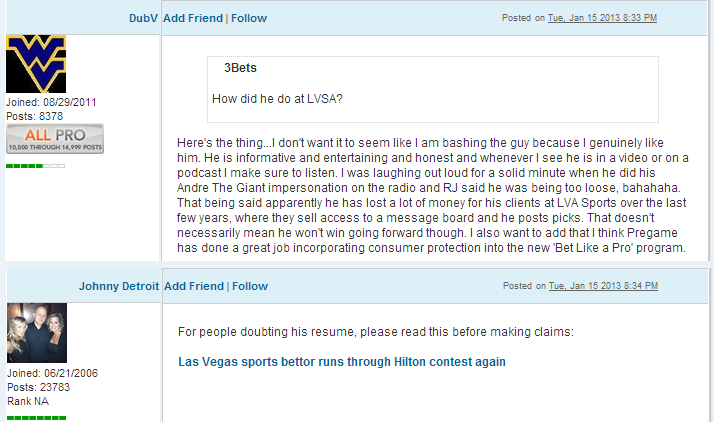 As various people commenting in that thread are clearly aware, from 2009 through 2012 Fezzik was a "host" at the LVA Sports forum. At LVA, he didn't technically "sell picks", but gaining access to Fezzik's sections was clearly the primary reason anybody would pay the monthly fee to view the message board. Oh, well I certainly see how that wouldn't be an especially effective way to advertise a $1000/month service! It really does seem like we're relying quite heavily on 170 picks made against stale contest lines years ago, doesn't it? Hey, 2007 Fezzik, what do you think of this marketing strategy? So, Mr. Bell, what was that about people being "unable to prove any element of a scam"? And with that, I think we've finally come full circle. In truth, the BLAP kickoff was nothing short of a classic tout scam. Fezzik made money off his name at LVA for as long as he could, then when that was no longer tenable he jumped to Pregame. At that point, Bell and Detroit did everything they could to ignore Fezzik's documented record over the past four seasons, instead bringing up his contest wins as often as possible. While it's easy enough for the Pregame folks to abstain from advertising Fezzik's 2009-2012 record themselves, that's not sufficient, as there are plenty of unhappy LVA customers who wouldn't approve. Not a problem, though, when you can prevent dissenting replies from ever being seen. That's only the beginning though; what do you do with Fezzik's records when he inevitably fails to "win long-term" at Pregame? We'll save that lesson in creative accounting for Part Two.